Rediff.com » News » Why was Mahatma Gandhi blindfolded in Brazil? Why was Mahatma Gandhi blindfolded in Brazil? 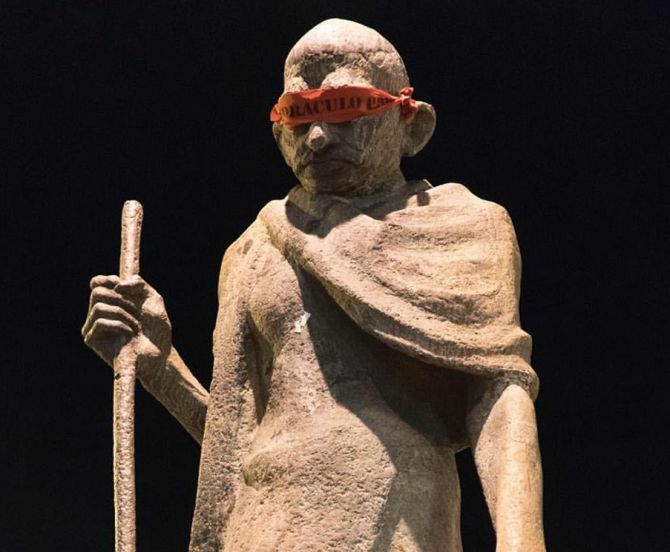 In an act of protest against a corruption scandal that has stirred Brazil one artist has blindfolded several 100 statues, including one of Mahatma Gandhi. Throughout the city of Rio de Janeiro statues of prominent leaders and artists and even international figures have had red blindfolds placed around their faces. Among the statue of international leaders that have been blindfolded is also a statue of Mahatma Gandhi. This dark spin on the Gandhi mantra of ‘see no evil’ is the work of a Brazilian artist, who asked to remain anonymous and who described the effort as a silent protest. The artist said that the shielded eyes mean that those who cannot do anything to change the country stand in contrast to living Brazilians who, according to the artist, have the ability to do something to change the dismal state of the nation. The protests on Sunday saw crowds calling for President Dilma Rousseff to resign. The demonstrations followed the announcement of a formal investigation into former President Luiz Inacio Lula da Silva over an alleged bribery scheme involving the state-owned oil company Petrobras.